Kendall joined the Energy Policy & Economics Group at Pacific Northwest National Laboratory (PNNL) in 2017. 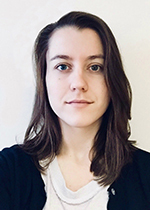 She is currently a Post-Graduate Research Associate and contributes to projects focused on evaluating the benefits of microgrids and energy storage systems. She holds a BS in Quantitative Economics from California Polytechnic State University and an MSc in Economics from the University of Edinburgh, where she graduated with honors.